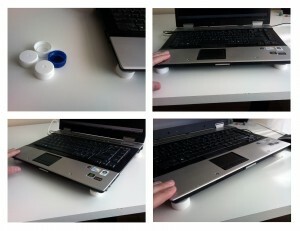 Here is a free practical solution for the laptop that I made up a few weeks ago in extremely hot day. If you also use a high-end processor in a slim body and need to work instead of going to beach, you might have experienced the same heat source! I have no complain as it warms my hands in cold winter however it gave a kind of ‘burnt’ sensation recently and it always gets worse in summer days. So these plastic bottle caps help! 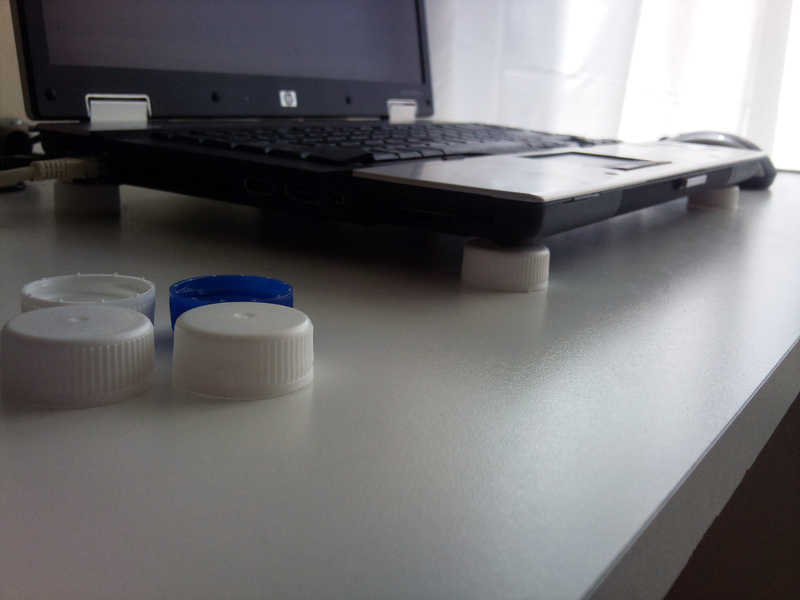 We can save the laptop and 4 plastic caps from landfill. Plastic caps also have a nice small cavity at the center that fits to the feet of laptop so well-designed:) 4 caps lift the laptop and reduce the heat by allowing space underneath. 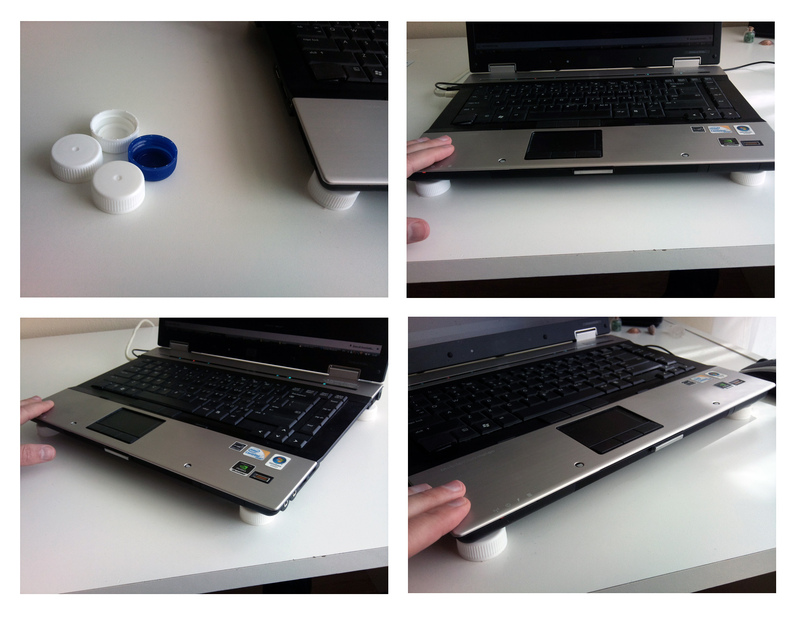 Moreover there is another benefit, now the laptop has more mobility on the desk. It slides smoothly and can be moved and rotated as you like.. The screen transforms easily from the working mode facing the chair to the movie mode facing the bed.. I wondered and checked the internet afterwards and found some similar laptop stands for sale. This is free, save the plastic caps and enjoy! I’m impressed, I have to admit. Seldom do I come across a blog that’s both educative and entertaining, and without a doubt, you have hit the nail on the head. The problem is something that not enough people are speaking intelligently about. I am very happy that I came across this during my search for something relating to this. Hi! Someone in my Facebook group shared this site with us so I came to take a look. I’m definitely loving the information. I’m bookmarking and will be tweeting this to my followers! Terrific blog and outstanding design. Everything is very open with a clear explanation of the challenges. It was truly informative. Your website is extremely helpful. Many thanks for sharing! I simply want to tell you that I am very new to blogs and actually loved your blog site. More than likely I’m likely to bookmark your website . You definitely come with fabulous writings. Many thanks for sharing your blog site. Good post here, thanks for sharing the info. keep up the excellent piece of work, I read few content on this internet site and I believe that your web site is real interesting and contains circles of excellent information.